Saturday night, we came home from a week full of relaxation, reflection, and rejuvenation. As we were flying home, I was reminiscing about our trip and all the wonderful people we met. Everyday we would be greeted by the same people with a smile that stretched ear to ear. These same smiling people, would stop by throughout the day, wherever we were lounging, to ensure we were enjoying our time. Their spirit and positive energy was infectious and created an instant friendship from day 1. The people I’m talking about are those behind the resort – the one’s that make the resort exceptional. These awesome people work 20 days straight then get 10 days off. They are working in the 80-90 degree weather and constantly serving others with a bright smile on their face. Oh, and I forgot to mention, they just experienced a huge hurricane back in September that dramatically damaged their town, their job, and their homes. And they continue to smile. Cesar works in a few of the restaurants on the resort properties. I first met him at Cilantros restaurant at the sister resort. He was so kind that we sparked a conversation immediately. We asked him about the hurricane and how him and his family were affected. He said that the hurricane started at 10:00PM and didn’t end until 7:00AM the next morning. I can’t even imagine. He lives with his family – his mom and little sister. The windows in their house were blown out by the hurricane so to keep his family safe, he had to put his mattress against the window frames. In turn, they all had to sleep on the floor until they could get the windows fixed. Just horrible. And when he was telling us this, he had such a positive outlook on life that he never stopped smiling. He wasn’t looking for a pity party, he was simply explaining how life was for that blip of time. He did end his story by mentioning that the resort was covered in sand, the pool was filled with sand, and every single window was blown out. That’s a lot of windows. Thankfully, the resort had him and his coworkers continue to work and help rebuild. They never lost a day of work. That is what he focused on most during that time – the positive part of such a traumatic experience we may never have to feel. Amen to that. Meet J. Luis and Linda. 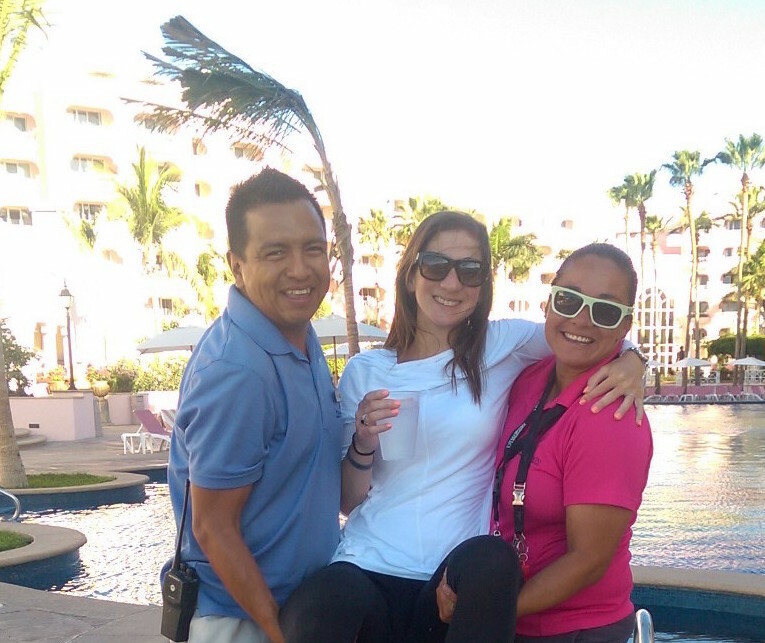 J. Luis is the evening event coordinator at the resort. He never stops smiling and is always asking if he can do anything for us. He genuinely wants everyone to be happy and enjoy their time. And he always hugs you with the biggest, most authentic hug. And I loved that because I’m a hugger too! Linda is the activities director at the resort. She is standing in the heat all day, coordinating activities with Luis at the pool. She is constantly bringing everyone up and ensuring they are content. She also has such a lively personality. She is always having fun with everyone and everyone is having fun with her. I left Cabo with 3 friends and gained immense insight into how I can better conduct myself at work and with my friends/family. I challenge you that the next time you are on vacation or on a business trip – connect with those serving you, build a relationship with them. In the end, I guarantee you will learn something. And hopefully you can provide the same for them. Nice thoughts and write up.